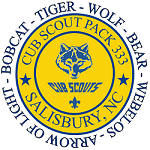 The Gold Rush is an annual outdoor event for ALL Cub Scouts and parents to enjoy together. Cost is $15 per Registered Cub and $10 per Participating Sibling. This Event is Electronic Registration by Pack Only! Pack Registration Deadline is Oct. 11th. Late registration Oct. 12 - 15, cost $20 per Registered Cub and $15 per Participating Sibling. No registration will be accepted after Oct 15th. One (1) Action Game for Every Den or 6 boys attending (there is no electricity or water source in the game field). Online Registration must be completed by Unit Leader no later than Friday Oct. 11th, to guarantee patch, T-shirt (if ordered), and assigned campsite. Late registration will be Oct 12 - 15. There is no guarantee of patches or assigned campsite (you may be put in overflow camping) during late registration. T –shirts cannot be ordered after Oct 11th. Absolutely no registrations will be accepted after Oct 15th. We want this first Cub Scout event of the year to be memorable and the very best it can be!! Packs are invited to camp for the weekend (arrival no earlier than 3:00 pm Friday). All food and equipment resources are the responsibility of the packs that choose to camp. There will be an exciting campfire at 7:30 pm on Saturday (packs may audition to present a skit at the camp office between 10am - 4pm Saturday) and a worship service Sunday morning from 8:15 – 8:45am. We look forward to a great time and appreciate your helpfulness! No pets will be allowed in camp. No large cookers (wheeled, that need to be pulled by vehicle) allowed, per Camp Ranger. Any special arrangements needed for medical, disability, or any other impairment must be approved by Jeremy Forsythe, Camp Ranger (704-961-8559) by Oct 15th. For your safety, closed-toe shoes only! By attending any/all of the Central NC Council Camps or Events, all participants (youth, adult and their parents, guardians, and family members) grant to the Central NC Council the right to use their picture, image, or sound recording of any type in promotional and marketing materials. Remember: Each Pack may have only one (1) vehicle (with pass) in its designated campsite for transporting gear between 3:00pm - 7:00 pm Friday night. For those coming into camp on Saturday, no gear will be transported to your campsite unless you carry it in by hand. One (1) Vehicle pass per unit will be included in your packet. Equipment trailers may be left in the campsite, but ALL other vehicles must be returned to parking lot. We must have your cooperation in this matter.